A spacecraft that Lockheed Martin built for NASA captured the first images of the near-Earth asteroid Bennu on Aug. 17 from a 1.4M mile-distance nearly two years after the space vehicle launched aboard United Launch Vehicle’s Atlas V rocket. NASA said Saturday it expects the Origins, Spectral Interpretation, Resource Identification, Security-Regolith Explorer spacecraft to arrive at Bennu on Dec. 3 to explore the asteroid and obtain a sample by July 2020. The OSIRIS-REx spacecraft will observe Bennu for dust plumes, spectral and light properties and explore the asteroid’s surface features by the middle of November during the approach phase. Some of the science instruments aboard OSIRIS-REx include the OTES thermal spectrometer, REXIS X-ray spectrometer, OLA laser altimeter, OVIS infrared spectrometer and the OCAMS camera suite, including PolyCam, SamCam and MapCam. The spacecraft is equipped with an Aerojet Rocketdyne-built propulsion system composed of 28 rocket engines. 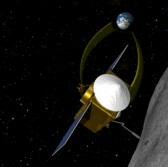 Aerojet said Friday the 28 delta-v thrusters will work to slow OSIRIS-REx’s speed by at least 1K miles per hour to facilitate the spacecraft’s arrival at the asteroid. NASA said the spacecraft will return to Earth by September 2023 and drop in Utah a capsule containing the collected samples. The agency’s Goddard Space Flight Center oversees the OSIRIS-REx mission, which is led by principal investigator Dante Lauretta of the University of Arizona, under the New Frontiers Program and works with KinetX Aerospace to navigate the spacecraft.